Warfarin sodium is an anticoagulant or blood thinner that reduces the formation of blood clots and their migration elsewhere in the body. It is used to prevent heart attacks, strokes and blood clots in veins and arteries. In the early 20th century, bis-hydroxycoumarin was discovered after a mysterious epidemic broke out in the cattle populations of the United States and Canada in 1920. The animals were dying of internal hemorrhaging that struck quickly and inexplicably. Two years later, Frank Schofield connected the disease to sweet clover hay, which had been widely used as cattle fodder since the beginning of the century. In 1940, Karl Link, an associate professor of agricultural chemistry managed to purify and synthesize dicumarol, the hemorrhagic agent in spoiled sweet clover hay. It seems that a series of wet summers had led to the infection of sweet clover fields by mold. In response, the sweet clover plants produced coumarin, a natural compound that defends against fungal infection. Link and his colleagues synthesized over 100 analogues based on dicumarol’s structure. In 1946 they developed the highly potent form that was patented by the Wisconsin Alumi Research Foundation organization. It was a compound that smelled, appropriately, like freshly mown hay. It was a toxin deadly enough to be used as a rat poison. They named it warfarin. Coumarin derivatives were initially introduced as a pesticide against rats and mice, and is still used for this purpose and at first warfarin was considered too toxic for human use. However, in the early 1950s, warfarin was found to be effective and relatively safe for preventing thrombosis and thromboembolism in many disorders. A navy recruit, in the 1951, took a large dose of warfarin to attempt suicide. Surprisingly, he lived, and clinical trials soon thereafter showed that warfarin could be administered safely to humans. It was approved as a medication in 1954 and the idea of warfarin therapy became widely known in 1955, when it was given to President Eisenhower after a heart attack. Although warfarin can be a lifesaver by preventing blood-clots, it was used to kill rats and even though it can help humans there still are strong side-effects including spontaneous heavy bruising, internal bleeding and hair loss, that need to be closely monitored by doctors. Too little of the medication won’t be useful but too much can kill you. There are several genes involved in warfarin sensitivity, making it even harder to adjust the doses correctly. Warfarin sodium decreases blood coagulation by inhibiting an enzyme that recycles oxidized vitamin K to its reduced form after it has participated in the carboxylation of several blood coagulation proteins. 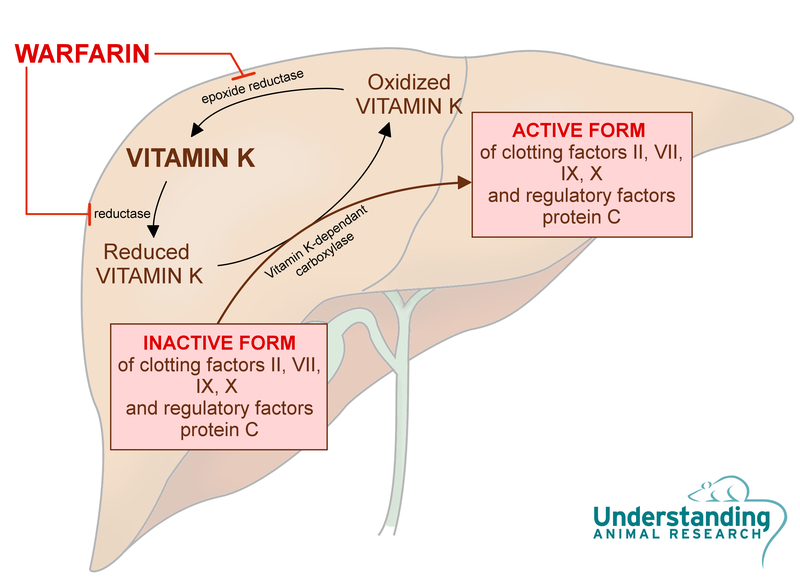 In short, warfarin antagonises vitamin K recycling, depleting active vitamin K. By doing so, it inhibits the synthesis of vitaminK-dependant active forms of calcium-dependant clotting factors.